The Strandloper Ocean Boutique is a privately owned hotel on the edge of the quaint West Coast fishing village of Paternoster in the Western Cape. It's just 120km north of Cape Town but a world away. The atmosphere is one of laid back luxury and the hotel has direct access to an 8km stretch of pristine beachfront and it also overlooks a small peaceful nature reserve. There are just 14 rooms, each uniquely decorated. The rooms vary in size and have either a sea view, enclosed courtyard or they overlook the neighbouring nature reserve. The interiors are a blend of beach organic and luxury, with locally made furniture and fittings and a good use of natural materials such as stone and wood. Designed to blur the lines between indoors and out are high ceilings and a terrace or courtyard with large sliding doors opening onto the distinct West Coast landscape. The light, bright rooms feature king size beds, open-plan bathrooms with a shower and bath or a shower only. Extra touches include a heated towel rail, hairdryer, satellite TV, DVD player, iPod docking station, fully stocked mini bar, and a coffee and tea station. The main areas consist of a small reception area, a wellness suite and a 20m lap pool with an attractive sundeck. There's butler service and scrumptious breakfasts are served each morning using fresh, seasonal ingredients, eaten in the Ocean Lounge or out on the terrace with magnificent sea views. The hotel also serves light lunches and delicious evening meals, dinners are a delightful home-grown gourmet experience with a local twist. Don't let the laid back feel of the hotel fool you, there is plenty to do here if you wish, alternatively you can relax and soak up the magnificent sea views. There are hiking trails to explore, beach walks a plenty or grab a mountain bike and explore further afield. July to December means whale watching, you could see dolphins too. Kayaking to a penguin colony is another popular activity. That's not all, there are some wonderful shops to visit, an art gallery and craft markets too, and the West Coast National Park is nearby with more to discover. Open: The Strandloper Boutique Hotel is open all year round. Location: On the edge of the quaint fishing village of Paternoster, about 1 and a half hours drive north of Cape Town. Sandwiched between the beach and a small private nature reserve. Rooms: There are 14 rooms and suites in total, each individually decorated with a modern, luxurious beach feel to them coupled with earthy tones for warmth. Each has either a private courtyard or a small terrace offering a peaceful place to sit and relax. In keeping with the down-to-earth nature of this traditional fishing village, the Strandloper Ocean Boutique Hotel has sourced locally made furniture and fittings and natural materials like stone, wood and organic linens. Activities: The Strandloper Boutique Hotel offers access to beach walks, hiking trails, mountain biking, fishing, kayaking to a penguin colony, horse riding trails, beach buggy trips, golf, boat cruises. In season (July to December) you may see whales and dolphins off the coast. The West Coast National Park and the West Coast Fossil Park are nearby for you to explore. Facilities: The hotel has 24 hour reception with concierge and porter service. The hotel restaurant, Leeto, has fantastic sea views and is open daily until 9pm. There is an on-site wellness suite offering treatments. The communal lounge has a warming fireplace and cosy couches. WiFi and direct dial phones are available in each room. There is also a laundry service and 24 hour security. The sun deck houses the 20m lap pool where you can cool off in the heat of the day. Dining: The Leeto Restaurant serves breakfast, light lunches and dinner. The scrumptious breakfast spread is included in your stay. Where possible local and seasonal ingredients are used and lovingly transformed into delicious meals with a local twist. Braai and seafood grill evenings are especially popular with booking advised. Children: Children aged 14 years and over are welcome. Communication: There is complimentary Wi-Fi internet and telephones in all the rooms. 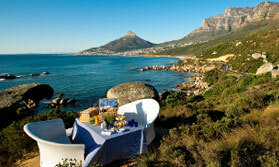 A holiday covering Cape Town and some of the less visited areas; the west coast and the beautiful Cederberg mountains.